The day my baby took her first steps marked a major turning point in both our life journeys. On the very day of her first birthday, our daughter Rosie took her first steps. All around my sister’s home, there were gasps and claps, laughter and smiles. 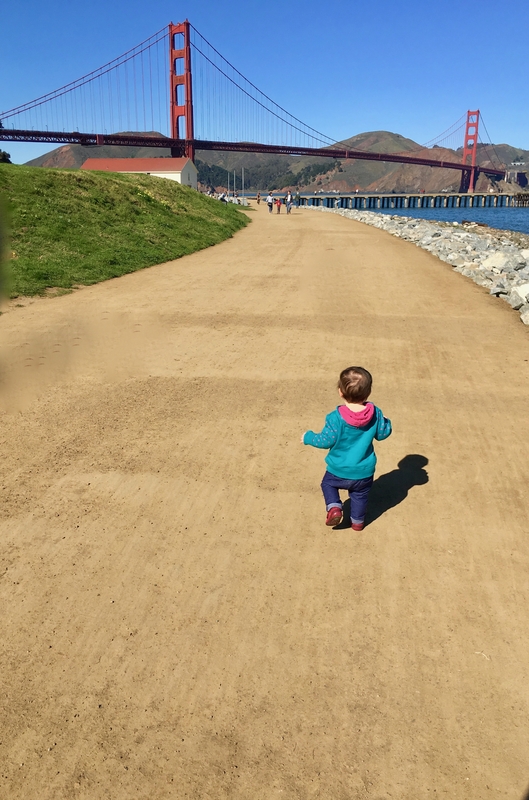 In the month since, I’ve watched her learn to walk—a rite of passage from babyhood to toddlerdom. Those small first steps left behind tiny footprints in our home and indents forever on my heart. At first, she staggered and wobbled around like a late-night drunk, but with each passing day, she walks with greater confidence and increasing speed. Each step brings joy, and she constantly displays an incessant wonder on her face as to what she’ll discover at the end of her horizon (currently, the length of our hallway). The great irony I’ve come to appreciate as a mother is that you start by wanting for this moment to arrive and for your baby to pass this important milestone. You celebrate it, and then—in that very moment—you realize your greatest fear: she is now about to embark upon her journey. Hers, and hers alone. The life form that once grew inside you, the limbs you felt kick as they developed, the human you gave birth to, has now begun the process of leaving you behind. However, the inalienable truth is that my path was never hers to follow. This is the quintessential meaning of motherhood, the essence of our individual humanity. As much as I never mistook my mother’s path for my own and determinedly pursued my personal journey, I must now internalize that most fundamental law of nature: Rosie’s path is not to be confused with mine. My mother is the hero of my journey, as much today as when I was a child. Now, with the distilled wisdom that accompanies being forty, I’ve come to recognize that I’m also the hero of my own journey. How do I teach Rosie that she, too, is a heroine? How do I equip her with the skills to forge her own unique path through life? As parents, we are tempted on a daily basis to either carry our children on our backs to spare their little feet or to run ahead of them and create a glide path that eases their passage. Of course, what we should be doing is teaching them how to read a map, how to chart their own course, and how to follow their own North Star. My path will continue to twist and turn, as it has over the first four decades of my life, and so, too, will Rosie’s. Sometimes those twists will take us in a direction towards one another; sometimes they’ll diverge. I want so much to arm her for the road ahead that my heart breaks with my inadequacy and inability to do so. How do I teach her to choose her companions carefully along the way? To know the difference between those who seek to lead her astray from those who will use their lamp to help illuminate her way? How can I equip her for the various inclement conditions she’ll face? More importantly, to ensure that the baggage she carries when leaving home—emotional, physical, psychological—is as light as possible? Most of all, how can I make sure that I don’t offload any of my baggage onto her? Some of us use our children’s journey as an extension of our own or, worse, as a way to get us back on the right path after life has diverted us away from where we once thought our journey would go. But detours happen for a reason, often steering us away from whatever danger lies ahead. Our child’s journey is not an opportunity for us to hit the reset button and start all over again. To confuse Rosie’s path with mine would serve only to curtail her journey and derail my own. I know my path will likely end before hers, as my mother’s will perhaps before mine, but I hope that when I embark upon that eternal expedition, it’s in the knowledge that my footprints will continue to serve as a guide to Rosie—and perhaps others, too. I pray I will have taught her that life is not about the destination where we end up or the material things or accolades we accumulate along the way, but that the real journey—life’s true journey—is the one that takes you to the very heart of yourself. What I marvel most about Rosie’s first precious steps is that, no matter how many times she falls, she doesn’t hesitate to get right back up and stride even further and faster. Those falls don’t paralyze her with fear or make her hesitant to try again. Yet, at some point in all our lives, they begin to do just that. But I can’t. You just fall, baby girl. It happens. Sometimes we stumble, and sometimes we trip. Often, we do it to ourselves even when there isn’t any obstacle in the way. It happens to you now because you’re going faster than your little body is able to balance. What matters most is that you continue to do as you do today. You get back up, dry those tears, put it behind you, and continue your journey, even if that’s just as far as the next room. Oh, Rosie. Those tiny feet and little steps. That smiley face and sturdy stand. Those eyes of wonder and heart without fear. Go now and begin your unique journey, filled with hope, joy, and all the love the world can bring. Go. Enjoy every moment and mile. Marvel at the view from the top of the mountains you’ll inevitably climb and absorb the lessons you learn from the depths of the valleys into which you’ll descend. Relish the warmth of the bright sun above your head and the beauty of the earth beneath your feet. Love the companions you meet, even those you’ll leave behind. Be thankful for the wind at your back as much as the rain upon your face. Stop to admire the beauty of your surroundings and never lose the awe for all that you’ve seen. Never fear the road ahead or look back on the road from which you came. Dearest Rosie, you were born with everything you need to make it to your destination, to forge your own path. Trust your internal GPS. It will never let you down. Should I not be here to help you with your navigation, look to the sky and the stars I’ll shine to light your way or the signposts I’ll leave in unexpected places. No matter how hard or easy, long or short, your journey turns out to be, go forward knowing that you were the best part of mine.